Don’t tell my scale. 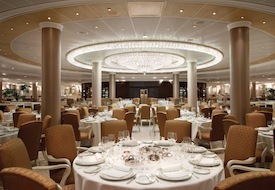 A little over two weeks ago, I was enthusiastically taste testing my way through the 10 restaurants onboard Oceania Riviera (one of our Top 10 Cruises in 2012), the brand new 1,250-passenger upper premium ship that was christened in Barcelona, a foodie-friendly city if ever there was one! Also a perfect match: the ship’s fit and elegant godmother, Iron Chef Cat Cora (shown at left), who took time from promoting her new Bravo series Around the World in 80 Plates to help break a bottle of bubbly against Riviera’s sparkling white hull just before we set sail for molto magnifico Venice. As I sipped and savored my way around the ship, sampling everything from foie gras with artichoke puree to lobster pad Thai – not to mention whipping up my own flaky scones and fluffy zucchini-and-mint frittata in the Bon Appétit Culinary Center – I began to question whether I love cruising more for the alluring and ever changing ports of call or for the indulgent, food-centric focus of many new ships. Read on to find out whether culture or cuisine won out. Jacques: Provencal in ambiance but a classic bistro at heart (with a focus on a rotisserie), this charming restaurant (shown at right) is the first to be named for its executive chef, the irrepressible Jacques Pepin. 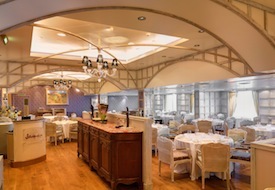 His signature dishes shine – such as the aforementioned foie gras dish (there are actually two on the menu), the duck à l’orange and the Brittany-style Maine lobster baked in the shell. As for the desserts, our table decided to sample them all and I can pronounce two irresistible: the Charlotte Cecile (a Valrhona chocolate and vanilla lady finger cake) and the vanilla, chocolate and coffee pot de crème trio. Red Ginger: Hands down the ship’s sexiest eatery, this Pan-Asian emporium is awash in rich red textures and bold artwork (as is the entire ship to the tune of 1,000+ paintings and sculptures chosen by Oceania founder and chairman Frank Del Rio). Favorites, in addition to the lobster pad Thai, were the spicy duck and watermelon salad, the crispy ginger calamari, and the miso glazed sea bass. I also enjoyed two cool touches: a choice of five chopsticks (from red or black lacquer to mother of pearl inlay) as well as a tea menu (the white ginger pear was lovely). Polo Grill: This steakhouse is the spot on Riviera for meat eaters. I dined here my first night onboard and even though I am pretty much a non-carnivore I found plenty to satisfy my palate – from a roasted beetroot and garlic goat cheese Napoleon to the Chesapeake Bay crab cakes. Toscana: If not for the fact that the staff neglected to pour our red wine until our dessert was about to arrive (we enjoyed the white, of course, and this would have been a bigger issue had this not been the ship’s second day with guests onboard), I would have loved everything about this Italian restaurant – especially the artichoke and parmesan cheese timbale with black truffle sauce and the zucchini and fava bean risotto with burrata and black truffle. There’s even an olive oil and balsamic vinegar menu (delicioso!). La Reserve by Wine Spectator: Alas, my missing link was this intimate, 24-seat room where for an extra charge of $95 per person, guests can enjoy a seven-course tasting menu with each course paired with a specially chosen premium wine. Terrace Café: Buffets can be deadly, seducing you into “sampling” so many small portions of so many enticing dishes that you end up devouring two or three plates full of food. Thus, I commend Terrace Café for making its appetizer station so appealing – with not just fresh-tossed salads but also delicious smoked salmon, curried chicken salad, crab salad, assorted sushi, and a variety of flavorful vegetable dishes – that I rarely bothered to dive into the hot entrees (except for the yummy polenta and amazing salmon en croute). I did, however, succumb to trying three or four desserts at times. Open for breakfast, lunch, and dinner. 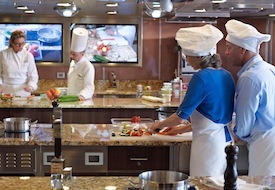 Bon Appétit Culinary Center: A cruise is a vacation, but it’s also a learning adventure. Oceania has taken this literally with the evolution of this sleek, 12-station (accommodating 24 students), hands-on cooking center, which was first introduced last year by Oceania on Marina. I am way more beginner than master chef and I enjoyed the no-nonsense instruction of culinary enrichment director Kathryn Kelly (who reminded me a bit of my ever-so-slightly intimidating second grade teacher). Cooking classes cost $69 per person and range from a Passion for Pasta and Healthy Mediterranean to Oceania Favorites from the specialty dining venues. If you’re really into learning a regional cooking style, you can also sign up for Culinary Discovery Tours, which combine chef-led excursions to markets and artisanal producers (such as wine, cheese, chocolate) in 25 ports followed by a port-inspired cooking class back on the ship (from $175 per person). 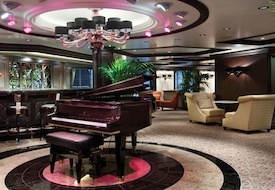 Staterooms, Spa, Lounges, Etc. 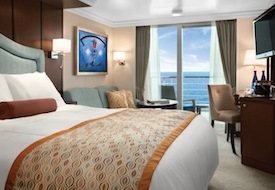 : It's always fun to be the first guest to sleep in a ship’s cabin and I am pleased to report that my 282-square-foot Concierge Verandah Stateroom on Deck 9 was beautifully appointed, with a seriously comfy bed and a full-size soaking tub in the marble and granite bathroom. If you can’t afford Concierge Level (which comes with a private concierge and other complimentary amenities such as a welcome bottle of champagne and a wireless laptop for use during the cruise – plus priority reservations in the specialty restaurants), opt at least for a Verandah Stateroom (the same size, shown at left). A worthy splurge is one of the 1,030-square-foot Oceania Suites designed in striking contemporary style by Dakota Jackson and featuring a private hot tub on the verandah. Riviera’s spa is by top-of-the-line Canyon Ranch Spa Club (with the lofty prices you might expect), but it’s worth booking a treatment just to be able to spend time on the private spa deck with its muscle-mellowing thalassotherapy pool. Another great relaxation spot is the nook-filled Library. Last but not least: Riviera’s bars/lounges. There are five (and you’ll pay extra for all alcoholic beverages), but my two favorites were Martinis (shown at right), where the friendly bartenders mix up a menu of 30 martinis, and Horizons, a lofty observation lounge on Deck 15 that becomes a late night disco (depending, of course, if gastronomically sated passengers have energy left to party). Okay, so what’s the verdict on my favorite reason to cruise – tempting cuisine or captivating culture? Sigh. Alas, sightseeing doesn't add any pounds (and can even drop a few), so I’ll go with culture. But it’s good to know that with a little discipline (there is fitness center – I know because I glanced at it) you can, like Riviera’s fit-at-age-45 godmother Cat Cora, be a slender, sea-faring gourmet. Riviera sails 10- to 15-day itineraries in the Mediterranean, Adriatic, and Aegean through November (from $3,137 per person, including airfare), after which she heads to the Caribbean and the Riviera Mayan. See our Cruise hub for more trip-planning information, then use our Travel Search price comparison tool to find the lowest rate on flights, hotels, cruises, and more travel deals.